What makes a film good? The story? The acting? Clever editing, good camera work, impressive lighting or maybe it all boils down to good direction? To me, very often watching a film is only half as interesting as reading about it afterward. I love learning all those quirky facts, like that all the "why was I fired"-scenes in Up in the Air were made by placing an ad in a major newspaper, claiming a documentary about the financial crisis was seeking people who were willing to talk about being let go from their job, on camera. Knowing this fact somehow made the movie all the more enjoyable, even though I didn't know about it when I saw it. 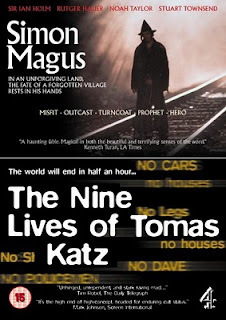 So is definitely the case with The Nine Lives of Thomas Katz. When I first saw it, I thought it was mildly interesting, but a bit too weird, even for me. Describing what is about right after you’ve seen it, is not an easy task. But then, when I later read that pretty much all the film was improvised, I could not help but be amazed. For the filmmakers claim that they had no script. No plan or outline, script notes or storyboard. All they had was vague ideas of where they wanted to film. They got together a crew, drove over there and let a few “actors” do whatever they wanted, in front of the camera. This behind-the-scenes-fact makes the film nothing short but miraculous, and I challenge anyone who thinks different to attempt the same feat for themselves.